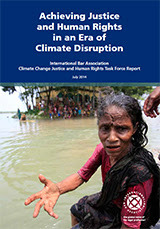 The human rights of the world’s most vulnerable will be severely threatened unless urgent action is taken to improve access to justice and legal frameworks for people affected by climate change, concludes a new report by the International Bar Association (IBA) Task Force on Climate Change Justice and Human Rights. Published today, the ground-breaking 240-page report Achieving Justice and Human Rights in an Era of Climate Disruption finds that, while climate change affects everyone, it disproportionately strikes those who have contributed to it the least and lack the resources to respond. The Report assesses the severe challenges currently facing national and international legal regimes which are poorly suited to provide legal remedies to those most affected, and outlines concrete recommendations for reform to create climate change justice structures that actively help protect and preserve environmental and human rights. Through the more than 50 recommendations, proposed across short, medium and long-term timeframes, the Task Force calls on world leaders, policymakers, lawyers, corporations, trade bodies, human rights bodies, communities, scientists and individuals to take ‘joint, bold action’ to achieve climate change justice. The Report’s recommendations are the result of a comprehensive survey of domestic and international law relevant to climate change and of the ways in which these laws and legal systems impede or constrain the realisation of climate justice and human rights. The Task Force, co-chaired by David Estrin, Chair of the IBA’s Environment Health and Safety Law Committee, and Baroness Helena Kennedy QC, Co-Chair of the IBA’s Human Rights Institute, emphasises that the time for action is now and that unless reforms are put in place, current effects – including increased incidence of worsening droughts, hurricanes and heatwaves – are likely to be ‘dwarfed by the future consequences of climate change’. These include rising sea levels, unprecedented weather disasters, depleted freshwater reserves, vanishing ecosystems and food supplies, as well as risk of serious social disruption, lost livelihoods, mass displacements of peoples, and loss of cultural, family, community and language continuity.